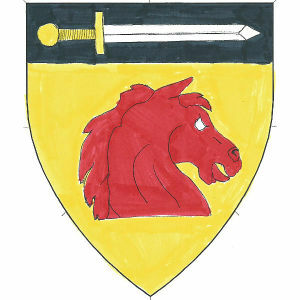 Or, a horse's head couped contourny gules and on a chief sable a sword reversed proper. Sir Sigvaldr Bjarnarson is a member of house Drengsheim. At Spring Crown Tourney 2019, Sigvaldr was offered admission to the Order of the Chivalry by TRM Adam and Stæina. He was knighted at closing court. This page was last modified on 25 March 2019, at 20:47.